Manufactured from premium food grade cup stock, single poly-coated, Barista Double Wall Paper Cups for hot drinks, available in a range of sizes. Barista cups are designed to co-ordinate with Weave design cups. Made for the Coffee to go Market. Superb heat insulation from double wall barrier design, this makes the cup comfortable to hold and gives it strong heat retention qualities. 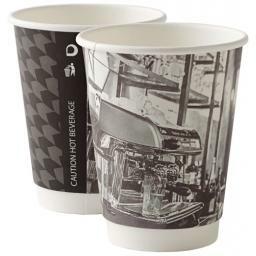 Barista cups feature 4 different assorted designs, all based around the Coffee Barista theme. Each pack contains a random assortment of these designs rather than a single design per pack. 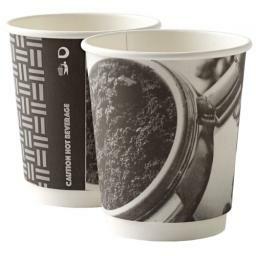 Barista Design Paper Cups for hot drinks. Made for the Coffee to go Market.